Tablet-News.net / Android / Samsung Galaxy Tab 7.7 Hands On Video; 7mm Thick! 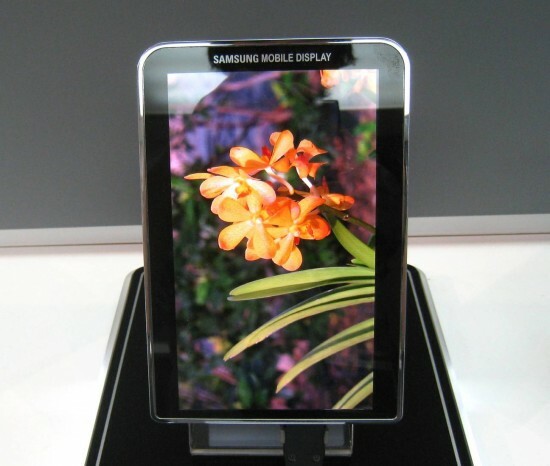 Samsung is looking to set another record for thinness with its new 7mm tablet. The Samsung Galaxy 7.7 is supposed was announced today at IFA in Berlin and we we’re able to get our hands on one. It appears that the models will be numbered GT-P6200 and GT-P6210 since Samsung certified one of the models earlier in the week for Wi-Fi and Bluetooth. It should make it to this years Christmas shopping. The Galaxy 7.7 will feature enhanced performance over previous Samsung tablets. The Galaxy Tab 7.7 sports a Super AMOLED Plus display! A 1280 x 800 resolution which we’re used to see on 10-inch tablets. The 7 incher weights about 335g / 12oz, most the highlight is its thickness just 7.89mm / 0.31in!